When decks take on age, they tend to deteriorate and need either repairs or facelifts. Many fixes call for the main beamed structure to be left in place while slats on the deck platform, steps and/or rails are replaced. Repairs can also take the form of failing or questionable attachments, settled or heaved footings or remedying structural concerns. With fixes priced according to man hours and supplies on the job, each repair assessment will differ in its nature. But many of the same types of conditions continually appear. Also, correcting issues to some areas of the deck may end up acting as a mode of prevention, affecting the structure of connected components. For example, rotting pieces can spread to nearby spots, or a loose railing can destabilize adjoining rails. The simplest repairs can be as affordable as $15 to $75 for those doing the deck repairs themselves. Like replacing a couple of rotten floor slats, or resecuring a loose handrail. Beyond doing yourself, the handyman option is normally the next, least expensive option followed by the professional deck carpenter - many who have skills at integrating repairs seamlessly back into the intended design. 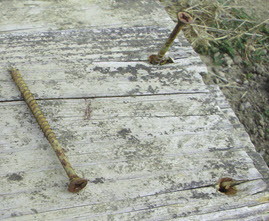 Attachments - pulling and replacing rusty screw heads can prevent rust stains and should be done to help preserve the deck stability. Too, swapping them out should be done before the screws begin to loose structure to the point where they snap off when being removed or otherwise. Note: certain formulations of screws have been known to decompose prematurely. Before replacing you may want to contact the manufacturer, if possible, and see if any such warranty covers the screws degrading. Replacing all screws on a 10' x 12' deck can be accomplished in a couple hours. This figures $30 in materials, and roughly $53.00 for stainless screws as an upgrade assuming compatibility with the existing wood surface. Or about $90 to $140 for when hiring out with standard screws, assuming adequate conditions for removal (no breaks-offs or manual extractions). Changing out the secured pieces as well may be an option. To either pressure treated or another type surface offering enhanced longevity (see below). Though some surfaces, such as composite, may specify a new span width for supports. Platform/Stairs/Handrails - all rotting members should be replaced in the interest of the deck and those users it supports. And it is easrer to achieve a closer match given some set time (for weathering of pressure treated replacements) and/or that a solid finish color already exist on the current decking. Replacing individual floor slats is fairly inexpensive on a per-board basis, if doing yourself, but as is more likely the case with many decks, changing several at once helps justify the setup by a carpenter. A single 2"x4"x10' can be changed out for $7 when doing yourself, though figure at least $75 bare minimum to get a deck person out on premises (one with whom you are on good terms with, for about 1/2 day) and that may cover little more than several slats. Although in reality, others may want $125 for the same project. Changing out the whole walking platform could also be an option. Pulling the deck slats off a 10'x12' flat open deck surface will tend to cost in the $375 to $450 range for graded pressure treated pine, slightly less for the floor if hand rails are to be done too. Which could be done for about $190 in materials alone for pressure treated lumber and screws. More in materials for composite synthetics, and natural wood products like cedar and epi that also bring increased labor costs for the install. Typically, disproportionately more for larger square footages. Handrails often relax their firmness due to wear and the ravages of weather and time. Possibly, the looseness may be cinched back together at the corner joints, or lower lag screws tightened or replaced. Which are fairly minimal requests, unless new spindles or rail tops are needed. If handrails are shaped in rounded caps, they may come in 3 pack kits to be done all at the same time, the caps alone starting near $69 and that can still be done for hire beginning near $200 on a 120 square foot, square deck and under with prices ascending from there. Stairs take a lot of wear. Replacing risers is overall easiest in the staircase. If a tread has to be pulled out of its mortise, then it will cost more for the extra effort. And if the side stringer(s) themselves need attending to, it may or may not make sense to replace both sides which then draws in a set of stairs. Some of the simplest, single pieces should cost $40 to $75 but if larger sections are being performed, beyond the couple step solution, it could price out at $225 to over $600 for more extensive work leading to taller heights. Structure & Footings - should always be inspected regularly with the rest of the deck, even where visibility takes added effort. Adding strength to springy decks may call for added support. Where beams on the below framing may or may not be sistered on to existing joists or they may have to be replaced altogether. A repair, calling for expertise and probably two carpenters depending on beam length will affect cost, many times likely to be $125 to $175 and maybe greater. Adding joist ties is fairly inexpensive, for those that are absent. Assuming a minimum deck height & that boards don't have to be pulled for access. The ties are roughly $1 each but the install or replacement will be based on straightness and the ability to prop and reposition the new hangar. Price highly variable on circumstance (especially for replacements). Piers which have heaved/deteriorated footers are most often re-dug with the posts replaced. Digging below the frostline to help prevent any future lifting movement as a result of freeezing temperatures. This operation may require propping or adding temporary support with a jacking system during the process until everything is complete. Almost always, there is an entire set of piers to be dealt with, since all typically are set in the same manner as a manner of procedure (excluding deteriorations due to placements, etc.). Resetting piers for ground level decks begin only around $25 or $30 each for materials alone but this is labor intensive and is more probable to be priced at least three-to-four-times this rate at minimum (short posts) when performed by contractors to prevent ongoing settling, more for taller posts. Landings - those supporting stairs, can settle and bring about unevenness. Replacing pavers or stones with poured footers for support can prolong the life of the stairs - which could be considered a longer term, preventative cost. Ventilation/Air Circulation - modifying current enclosures, is a custom price solution that should be integrated into the deck architecture. Always keep the floor board gaps clean, which can be done for no cost, to help preserve the deck. Related Prices: maintaining the surfaces can deter certain affects. As we also look at deck staining costs and the intitial quality integrated into deck building costs both of which may partly determine future repair bills. Keeping the deck surfaces clean and with adequate ventilation including on the floorboard gaps and underneath the platform framing can act to extend its serviceable life. As may a proper, protective finish to guard against the harmful weather including UV rays off the sun. Making sure footers are set at an adequate depth initially should help stabilize the structure. Under certain conditions, making a switch to another type of decking surface, such as to composite decking from pressure treated, for example, can possibly result in reduced yearly amounts being spent based on a variety of factors. 1 The use of hidden fasteners may be an option on some decking surfaces which take a special bit. About $13 for #7 100 count box (#7) or $29 for a 350 count container.